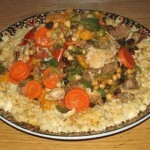 Lamb and Squash Stew is a Moroccan food recipe served over couscous. Heat oil in the bottom of a saucepan and saute onions until soft. Add the meat, chicken, carrots, ginger, salt, pepper, and water, and simmer for 45 minutes. Cover and allow stew to simmer gently for 30 minutes. Add all remaining ingredients to stew, and correct seasoning. Cook for about 20–25 minutes or until vegetables are soft but still separate and not mushy. 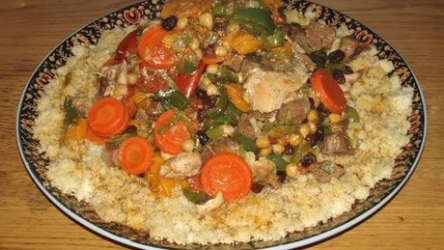 To serve, mound the couscous on a large, round serving platter. Make a large crater in the center. Arrange meat and vegetables in the center. Pour some of the sauce over it and put the rest of the sauce in a dish on the table.